Major General Charles Alexander Ramsay, CB, OBE, soldier: Born, 12 October 1936, in North Berwick; died, 31 December 2017, in Berwickshire, aged 81. Charles Ramsay was the man who put tanks on the streets of Scotland’s capital ­during an exceptional military career begun with the Royal Scots Greys. The city authorities were no match for his powers of persuasion, and he had his way, with 30 tracked vehicles, including 15 Chieftain tanks, thundering down Princes Street to celebrate the regiment’s 300th anniversary in 1978. Ramsay, at the time in ­command of the Royal Scots Dragoon Guards (Carabiniers and Greys), known as Scots DG, the Greys’ successor ­regiment, had brought his men up from Catterick, North Yorkshire. Today the regiment resides at Edinburgh ­Castle. The parade took place in spite of some local opposition, including worries about burst gas mains, and, it is recorded, achieved its end with little more damage done than the loss of a traffic light. “It was”, Ramsay recalled, “a fantastic occasion. We formed a Guard of Honour at Holyrood for the Queen’s arrival there and we did a special parade down Princes Street where Prince Edward, Duke of Kent, took the salute. For this we had a mounted section; I was at the head of it riding a grey horse which belonged to the Queen, called Banner. For his service Ramsay was appointed an OBE in 1979. He had already commanded C Squadron, Scots DG, on a tour in South Armagh, Northern Ireland, during which an IRA bullet ripped through the top of his Land Rover, narrowly missing his head. He would go on to command an armoured brigade at Osnabruck, the largest ­British ­military base outside the ­United Kingdom, with the British Army on the Rhine (BAOR)from 1980-82 during the Cold War; rise to the rank of Major General in charge of the UK Army’s Eastern ­District; and finally, from 1987-89, become Director General of Army Organisation and the Territorial Army. He was made CB in 1989. Throughout his Army ­service, which took him to Aden, Hong Kong, and Belize as well as Germany, his charm and powers of delegation ­echoed the personality of a father he hardly knew. 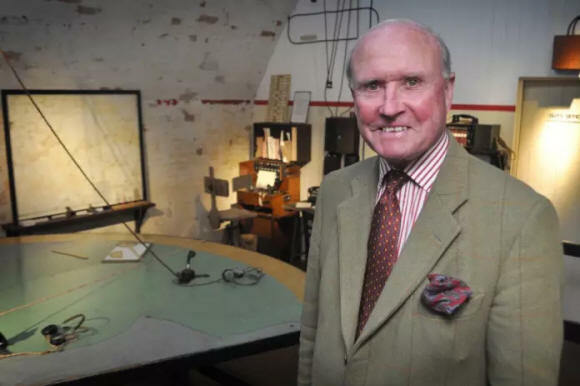 He was the younger son of ­Admiral Sir Bertram Home Ramsay, the officer who masterminded the evacuation of Dunkirk in 1940 and commanded Allied naval forces at D-Day, 6 June 1944. “He.. inherited many of the qualities that made the Admiral such a great military ­commander”, a senior ­officer who served under Charles Ramsay said of him. Only eight when the Admiral was killed on active service in an aircraft crash in ­January 1945, the young Charles grew up at the home his father had bought in 1938, and which is still in the family, Bughtrig House, near Coldstream in Berwickshire. But Charles Ramsay was to fulfil a love affair with Scotland that his father – plucked back to command at Dover from his own retirement when crisis erupted in May 1940 – had dearly wished to pursue, and of which the ­Second World War cheated him. Himself descended from the Ramsay baronets of Balmain, from Fasque in Kincardineshire, but brought up in ­England, the Admiral had hoped to end his days in the Borders, having married into another old Scottish family through his wife, Margaret, whose ­forebears founded the news distribution business John Menzies. His son would do just that: after retiring from the Army in 1990, Charles Ramsay devoted himself to managing the family estates, enjoying a foothold for the family both in the Lowlands at Bughtrig, and, from 1978, another in the Highlands, having bought South Chesthill in Glen Lyon, Perthshire. He became a director of John Menzies, and chairman of Scotland’s oldest wine merchant, Cockburn’s of Leith. He served as Honorary Colonel of the Scots DG from 1992-98, and for the rest of his life went on working for the regiment, including raising funds for its museum, which was reopened on a new site at the Castle by the Queen in 2006. He became a member of the Queen’s Body Guard for ­Scotland (The Royal Company of Archers), and directed ­Edinburgh’s Royal Military Tattoo. Known to his regiment as General Charles, ­Ramsay had an enthusiasm for sports cars, including his first, a ­second-hand MG with an Edinburgh number plate that he found in London, and ­later a series of Jaguars and, in the 1970s, a Ferrari 365GT2+2. He married, in 1967, Mary MacAndrew, daughter of the Ayrshire Conservative politician Charles Glen MacAndrew, who was made, in 1959, 1st Baron MacAndrew. They would have four ­children, ­William, Rowena, Camilla and Charlie, who, with his wife and brother, ­survive him. Horses were a lifelong ­passion, his favourite ­hunter being one from the 1960s called Ainsty – and he would recite the names of many ­further steeds, some of which he had painted in oils, and on which he took part ­during his Army career in events such as the regimental cross-country point-to-point, the Sprot Prize. In this he was victor in 1969 and 1977. He also played polo, hunted in Scotland, mainly with the Berwickshire but also the Buccleuch, and owned a series of winning racehorses. He enjoyed shooting, and treasured a pair of 12-bore­William Powell guns made for his father in 1938. Charles ­Ramsay was educated at Eton and Sandhurst, but would ­wistfully recall his early years in Scotland, especially his father’s rare wartime visits: “All I remember is this great excitement every time he came home and flew into Charterhall airfield”. By Anne Keleny in the Scotsman.